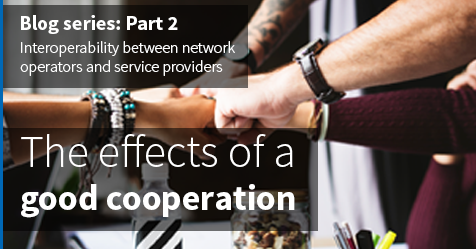 In a previous blog post, we talked about the importance of defining the cooperation between a network operator and a service provider. We listed six factors for a successful cooperation: Transparency, insight, technical interfaces, data quality, standardized product catalog and communication. So, what are the result if you take the above factors in consideration and act accordingly? We have listed a couple of effects that we have seen in the markets that we are working in. Possibilities for smaller network operators to attract larger service providers, i.e. get higher penetration in their network. The service providers start to see all the network operators as one consolidated market. This is especially important because the cost and investment made in marketing, sales, technical interfaces, communication channels and delivery of services can be split on a larger customer base. The service providers can offer first class help to their customers and can even act proactively. The operational expenses are heavily reduced when you don’t need to focus on bad data quality, non-existing or bad technical interfaces, few troubleshooting functions and much more. These factors are important even in a scenario where there is only one service provider that have exclusivity to a network operator’s infrastructure and for the cooperation to be successful. It is important to state that the open access business model doesn’t need to result in less innovation and possibility for more sales for the network operator. The reason for this is all the other services that can be offered to other customers types than in the private and SME market. The private and SME market in cooperation with the service provider can help to rollout the network and then it can be used for other services and customer types, e.g. smart city, smart home, smart metering, welfare services, public services, security and surveillance and much more. Netadmin has a lot of experience from the market where we are present. Each market is a little bit different, but it is still possible to see trends. To meet these different markets, we built our software with multiple componentsthat manage different scenarios and that facilitate a successful cooperation and interoperability between service providers and network operators. We are convinced that it is possible to succeed with a good cooperation that strengthens both parties. The service providers get access to a larger customer base and the network owner increases the utilization rates. All this knowledge is of course possible to apply in a scenario where a service provider has exclusive access rights to a network operator’s infrastructure. It is so important and fundamental to have a stable, robust and capable API as foundation for cooperation. This is the reason because Netadmin offers an OSS/BSS system with proven and robust API’s as well as web portals for service providers. The whole system has built-in support to handle the division and data integrity between service providers. The system covers many different areas, everything from subscription management to ticket flows. We have also experience of creating a marketplace for a whole market where the service provider connects to one single platform that then takes care of the communication to underlying networks.